Port Stephens in July. His Spirited 380 Tasha was fitted with a brand new set of North sails for the trip. "My brother Andrew, brother in-law Chris and myself sailed non-stop from Soldiers Point to the Gold Coast in 53 hrs. I don’t think this is any kind of record but it sounds good. Then my mother Bev, step father Mike, Andrew and myself motored through the GC Seaway to Manly (zero wind). Andrew and I sailed from Manly to Rosslyn Bay (Yeppon) where Andrew jumped ship. Then its was just me to the Whitsundays. I’ve had friends visiting and have Andrew, his wife Elizabeth, son Lachlan and myself to sailing back from the Whitsundays to Rosslyn Bay. Then its myself again (I’m hoping my father Frank will join me) back to Manly where she will have a marina berth at the Moreton Bay Trailer Boat Club (MBTBC) Marina. Had mixture of very light to strong (0-25) SW - SE most of the way. Top speed was 16 kts. A couple of times we averaged 12 kts over several hours. Tasha has performed very well (overtook several yachts/cats sailing north) and easy as to sail single handed.."
Tasha is now up for sale for anyone wanting a beautifully finished example of this design. Please contact us for further details. This Canadian builder is making progress with his Spirited 380. He is resin infusing his foam core panels on a laminating table and is very happy with the results. The savings he made on shipping the kit to Canada he has put into making his own panels. This is now an exciting option for the DIY 'infusion' enthusiast who has a keen interest in this cutting edge building process. For more information about this option please contact us to find out more. 'Siva' is a Spirited 380 launched in 2011 near Cairns Qld. The proud new owner, Michael Griffiths is on his way to the Whitsundays with his family and thought he would call in to say hello to us in Port Stephens. Michael has done some upgrades to Siva to streamline systems. 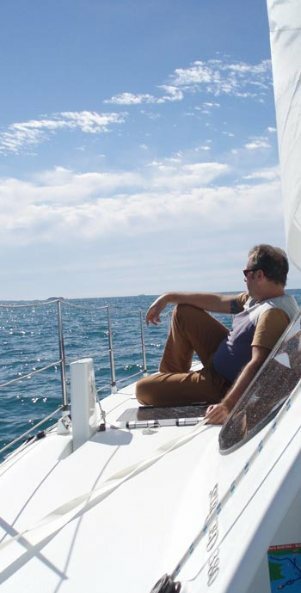 Michael has owned several sailing cats prior but chose the Spirited 380 for its excellent sailing performance, and he hasn't been dissapointed. On the delivery trip from Mooloolabah to Sydney Siva never dropped under 10 knots average speed the entire trip. Home for Siva is Botany Bay south of Sydney. We wish Michael and his family all the best on their trip North! See you on the way back! Rick and Carol Thomas from South Australia launched their Spirited 380 named 'Zeus' on the 22nd of April. This boat was featured earlier in our news when Rick had just finished the painting. Rick and Carol have done a beautiful job of finishing this boat with many compliments. 'Zeus' was built in 'the old fire shed' in the little sleepy beach town of Beachport SA. The project was started in July 2007 and was hull#14 to be produced. The rig and sails are next on the list to organize so we can all see this one sailing! A big congratulations to Rick and Carol! We were delighted to get a call from Chris inviting us to go out on Tasha for the day. Chris has been doing the last jobs on the boat since the launch. He has been living on Tasha in Port Stephens where he started his new job shortly after the launch. The boat looks good and we were reminded of the very professional and tasteful job Chris did building Tasha, and it is kept in tip top condition. We set off mid morning with very little wind, in fact we ended up having lunch in the middle of the bay absolutely glassed out with the sails up but doing nothing! After lunch we decided to motor across to Dutchies beach for a swim and a cold beer, while we waited for some wind. As it turned out the breeze picked up gradually as we headed back down the bay towards Soldiers Point where it eventually filled in to a steady 10 knots give or take. We had a nice work back from North Arm Cove with Tasha finding her groove and loving the conditions confirming her pedigree performance. A big thank you to Chris for a wonderful day out on the water! "We got out last weekend, with winds between 10 and 15 knots. At the end of the day when it was probably 15knots with about 0.75m of sea in Moreton Bay, the GPS said 11knots boat speed with a main and the jib up on a broad reach. We seemed to be passing every boat we encountered all day, even downwind!" We'll keep working on the owners for some on-water shots of the boat! This builder has been steadily progressing in a little beach town called Beachport in South Australia. He is hoping to have the boat launched towards the end of the month. The painting is now done and looks amazing with equipment now being fitted - permanently! This will be number 26 to hit the water for this design and the excitement is building! The owner has promised some high quality photos of the big day as his son is a photographer with all the gear. Spirited 380 Hull #1 Launched!! 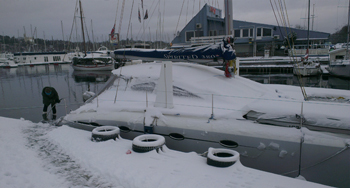 The very first Spirited 380 sold has been launched! This project was started in 2005 by the original owners from Belmont NSW in the shed behind their home. They put in an admirable effort for a few years until work took them away from home to WA where they ended up staying. The boat was relocated to Caves Beach where a local boatbuilder worked on it periodically until the project came to a standstill. The new owners Shane and Kate Simpson bought the boat in early 2015 and put a full work force on the project originally hoping to launch prior to Christmas 2015. Shane was very much hands on during the project and now knows every detail of his boat. Named 'On site', this Spirited 380 was launched in the Swansea channel on Sunday the 28th of February. Although the weather was forecast to be wet and windy, the day was quite the opposite, sunny and still. Everything went very smoothly with the new owners christened the boat with a bottle of bubbly broken over the pulpit! The rig and sails are on their way so we look forward to seeing 'On site' sailing Lake Macquarie very soon! Congratulations to Shane and Kate on the launch of their beautiful Spirited 380! We were contacted recently by the new owner of this Spirited 380 originally named "Bayerdere" hull #20 and launched in 2010. This boat was built by Seattle builder Jim Betts to a very high standard. This is the third owner from Boston and he is enjoying his boat now called 'Necessity' which hasn't seen a lot of use in its life so far. The owner is presently looking into building a Ripple tender to compliment his boat. We have been talking to Chris for the last couple of months about trying to organize a day out on his beautiful Spirited 380 'Tasha'. As it happened we spotted her out sailing on Port Stephens on New Years day! A rushed snap with the camera was all we got before she dissapeared from view. Chris has been sailing now regularly since stepping the rig in August last year. He has reported that the boat is very easy to handle on his own and he is loving his time aboard. Since launching the boat and moving to Port Stephens he has been a full time live-aboard. We will bring you better photos when we finally go for a sail with Chris! 24th Spirited 380 hits the water!! We are delighted to announce the launch of the 24th Spirited 380 in Brisbane Qld on the 16th of December named "Bush Spirit". You may have read in a previous post where this boat was built at the back of the owners bush block. Access was via a rough 'goat' track and this is the same track the boat was brought down for launching! This boat will be sailing soon and we will hopefully have some sailing shots to post of 'Bush Spirit' very soon. Congratulations to the proud owners! This Spirited 380 was built literally in the 'bush' at a property in Cedar Creek outside Brisbane. The goat track to the building site behind their residence is almost unpassable in the wet and a challenge even when dry! The temporary shed structure required careful planning to disassemble in a way that wouldn't risk damage to the boat. This has been a family build through and through with all members of the family involved. The finish is first class and the eye-catching red stripe is definitely a head-turner! This project was started in 2008 with part-time dedication put towards it to see it through. 'Bush Spirit' is due to be launched prior to Christmas so we will keep everyone informed once we see the 24th Spirited 380 in the water! First Spirited 380 project changes hands. The very first Spirited 380 kit was sold to its clients in Belmont NSW near Lake Macquarie in late 2005. The owners put in a valiant effort getting the boat to almost a structural shell. Following a move to WA the original owners decided to sell the project because nothing was getting done to the boat. The proud new owner is now pulling out all stops in an effort to get his new boat finished by the end of the year. Even though the boat has been out in the weather for the last few years the Duflex balsa structure is in good shape and is testament to this high quality product. We will keep everyone updated as to the progress of this project. Spirited 380 Carbon Fiber Boom Complete! This carbon fiber boom will be fitted to a custom 18m racing carbon spreaderless rotating wing mast which is nearing completion. Both mast and boom are dressed in clear-finished carbon for maximum appeal. The boom was resin-infused using ATL Composites' Kinetix epoxy infusion system for superior strength. A split female mould was made for the external shape of the boom and then a secondary mould was required to produce the internal box-section spar. The boom is designed to catch and house the mainsail when dropped. 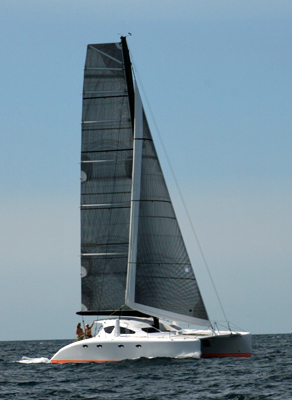 The sails will be supplied by Doyle Sails from the Sunshine Coast Qld and will be state of the art racing sails. The owner is hoping to have the rig stepped next month. This exciting project is nearing completion with the structure and main spar done. We are now installing the fittings and finalising the finishing details. The shell is resin infused carbon/foam with a decorative clear carbon Twill exterior. In order to achieve a good clear carbon finish on the outside and to also be able to infuse the part we had to make a mould of the boom. We created a plug in order for the mould to come together as a split mould which it then released from each side of the part. This boom is for a Spirited 380 which will be fitted out with a new carbon fiber mast and racing sails. This will be quite a show piece once rigged and we can't wait to see it all come together! Spirited 380 'Ara Leonis' to be sold! The owner of this beautiful Spirited 380 has instructed us to sell his beloved boat. We know this boat very well right from construction through to using her in one of our Sanctuary Cove Boatshows and extensive sailing trips aboard. The owner is selling due to health reasons and is looking for a best offer. The boat has not seen much use and for the most part is in like-new condition. This is an opportunity not to be missed. Spirited 380 Carbon racing mast! Another exciting Spirited project on the go is an 18m carbon fibre racing rotating wing mast and custom composite boom. The client’s brief was for a racing rig design to push the envelope in performance and efficiency. The rotating aspect of this design improves aerodynamics and wind flow onto the main sail. The mast will be resin-infused and most fittings will be composite and integral. The rigging will be PBO fibre and have ‘soft’ connection points to the mast. The boom is custom designed with a stylish curved underside to compliment the lines of the cabin top. It is also designed to incorporate a ‘stack-pack’ style sail bag which provides a large entry top so that the sail can be easily flaked as it’s dropped. 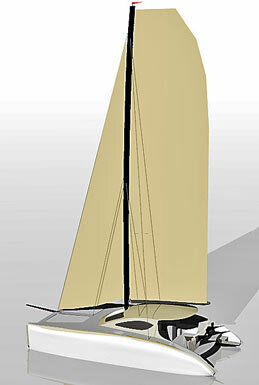 Yancy Smith from Doyle Sails will be making a full wardrobe of racing sails for this boat which will include a high aspect main with a square-top. Yancy knows this design very well since he has made the sails for almost every Spirited 380 launched. 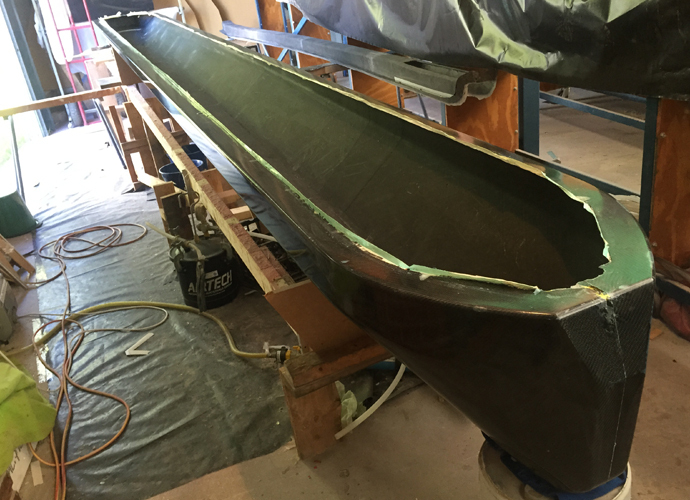 This client plans to race this boat competitively and we look forward to seeing the results. The Spirited 380 being built in Nowra NSW is looking much more finished with most surfaces inside and out primed. The level of detail can easily be appreciated with all fittings and equipment pre-fitted. Chris will live on this boat full time when launched so he wants everything perfect. This is always a nice stage to reach because the end is in sight! We can't wait to see this beautiful example of this design launched! We recently dropped in to see Chris Downing who is building his Spirited 380. 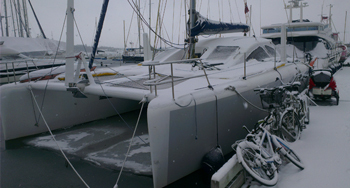 This project is progressing well and Chris is hoping to have her launched early in the new year of 2014. We were commissioned to do a customised interior layout for Chris which comprised of a larger L-shaped seating area in the saloon and a separate vanity area forward of the aft saloon bulkhead. This area works well and provides good storage on the outboard side of the vanity. The new layout also included a workshop area in the starboard aft cabin which has a fold down section to create a double bunk. This area is large enough for him to store his bicycle. Chris plans to live aboard permanently and is looking forward to his new lifestyle. We will let you know of how Chris progresses closer to his launch date.